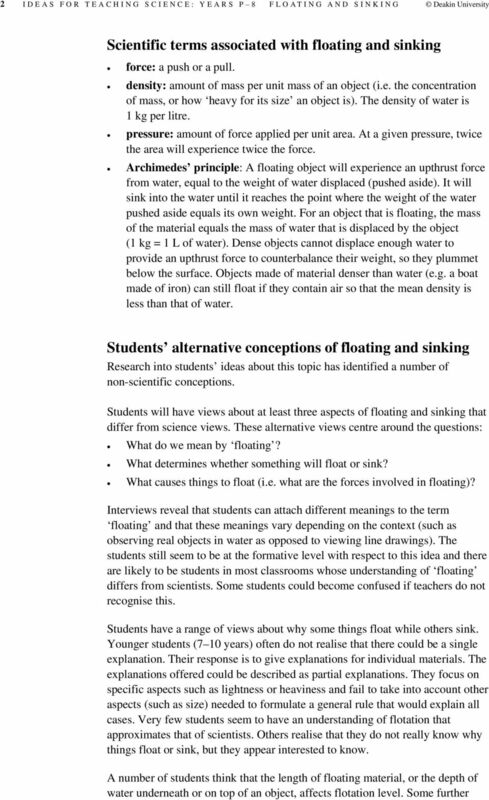 3 Deakin University IDEAS FOR TEACHING SCIENCE: YEARS P 8 FLOATING AND SINKING 3 believe that floating material will sink if the part above the water is cut off, or if it has vertical holes put through it. After initial experiences with reshaped nonfloating material, almost all students realise that non-floating material can be shaped to float. 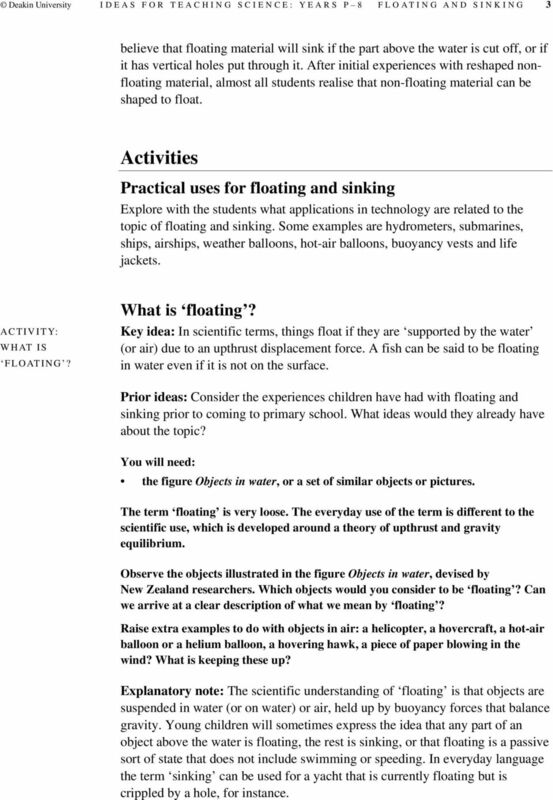 Activities Practical uses for floating and sinking Explore with the students what applications in technology are related to the topic of floating and sinking. Some examples are hydrometers, submarines, ships, airships, weather balloons, hot-air balloons, buoyancy vests and life jackets. WHAT IS FLOATING? What is floating? Key idea: In scientific terms, things float if they are supported by the water (or air) due to an upthrust displacement force. A fish can be said to be floating in water even if it is not on the surface. Prior ideas: Consider the experiences children have had with floating and sinking prior to coming to primary school. What ideas would they already have about the topic? the figure Objects in water, or a set of similar objects or pictures. The term floating is very loose. The everyday use of the term is different to the scientific use, which is developed around a theory of upthrust and gravity equilibrium. Observe the objects illustrated in the figure Objects in water, devised by New Zealand researchers. Which objects would you consider to be floating? Can we arrive at a clear description of what we mean by floating? Raise extra examples to do with objects in air: a helicopter, a hovercraft, a hot-air balloon or a helium balloon, a hovering hawk, a piece of paper blowing in the wind? What is keeping these up? Explanatory note: The scientific understanding of floating is that objects are suspended in water (or on water) or air, held up by buoyancy forces that balance gravity. Young children will sometimes express the idea that any part of an object above the water is floating, the rest is sinking, or that floating is a passive sort of state that does not include swimming or speeding. In everyday language the term sinking can be used for a yacht that is currently floating but is crippled by a hole, for instance. 5 Deakin University IDEAS FOR TEACHING SCIENCE: YEARS P 8 FLOATING AND SINKING 5 that sink, such as a paperclip). This will involve talking through what we mean by weight as opposed to density. Key ideas: Objects float or sink depending on the material they are made of whether they are heavy or light for their size. Air trapped inside objects reduces their effective density. This is also the case with boat-shaped objects. a tub or bucket of water various objects of different size and shape that will float or sink (cork stopper, eraser, metal paperclip, candle, plasticine, tennis ball, plastic lid, bolt, aluminium foil, etc.) Give groups of students ten or so objects and ask them to predict which will float in water, which will sink quickly or slowly, and which will float somewhere between. It would be useful to design a worksheet that will enable you to record predictions and subsequent observations of the objects in water, with comments. Challenge students to consider the implications if their predictions turn out to be incorrect. Use questions such as: Why do you think this floated and that did not? This did not float as you predicted. Can we work out why that is? Do you have a different view now? This crushed aluminium foil is floating. Do you think you could find a way to make it sink? Do you think these floaters have anything in common? After testing each of the objects, students should write down a reason why some objects float and others sink. Is there one reason or many? FLOATING/ SINKING STORIES Read Who sank the boat? (Pamela Allen 1982, Nelson, Melbourne) and/or Mr Archimedes bath (Pamela Allen 1980, Collins, Sydney), and discuss the relevant concepts raised in the books. Focus on what happens to boats as they take on more weight, and on the way water is displaced. 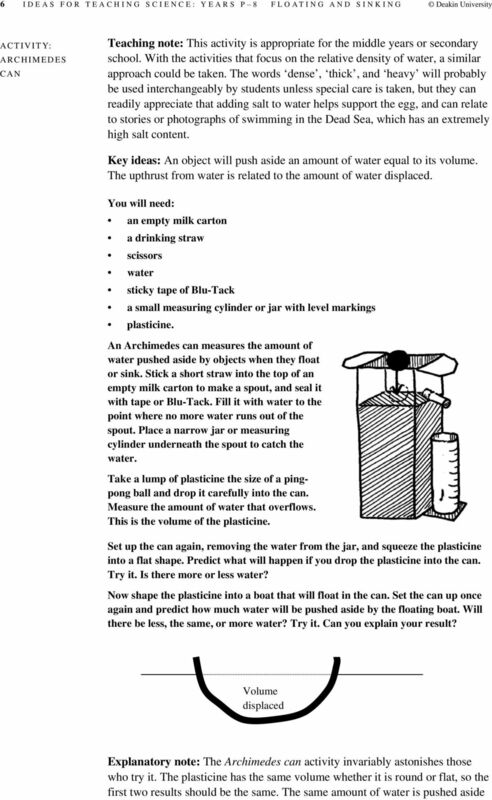 Notice that the displacement of water is determined by the immersed volume of objects rather than their surface area. FLOATING PLASTICINE Archimedes and boats Key idea: Dense materials can float if made into a boat shape. a lump of plasticine (for younger children aluminium foil can be more easily fashioned into a boat shape) a tub of water marbles to use as weights. Give students a ball of plasticine and ask them will it float? Students can test this after guessing. Ask the students could it ever float? When might the plasticine float? Students should be encouraged to make the plasticine float by itself by modifying the shape until it does. Having done this, the students could discuss the shapes they used. Which shapes float the best? Which shape will carry the most passengers (marbles) without sinking? 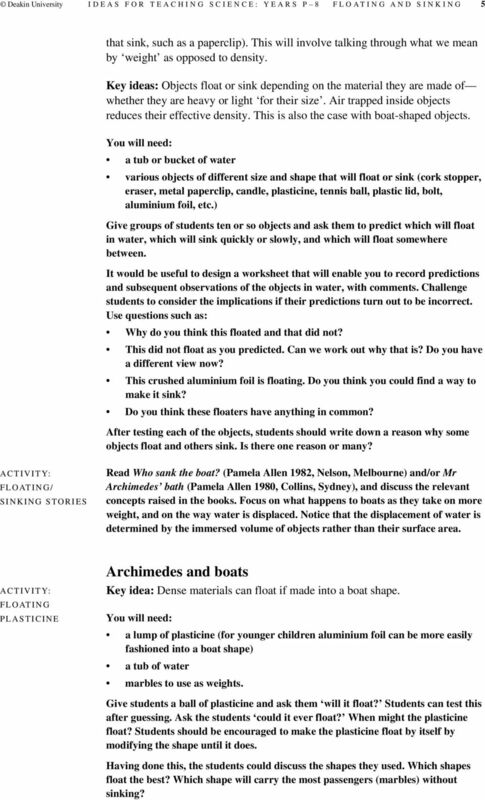 7 Deakin University IDEAS FOR TEACHING SCIENCE: YEARS P 8 FLOATING AND SINKING 7 by the same amount of plasticine. The boat, however, pushes aside much more water. The reason is that the air enclosed by the boat is also displacing water, and so more water is pushed out. This extra water pushed aside means that the upthrust force is much greater on the plasticine (Archimedes principle), and it will float. It is air enclosed within the boat shape, therefore, that causes the boat to float. UNDERWATER NETBALL? Upthrust forces from water Key idea: The upthrust increases as more water is pushed aside. a netball a garbage can full of water (this activity can also work with a medium-sized plastic ball in a bucket of water, but the effect is not as impressive). Attempt to push a netball under water contained in a garbage bin. You will be able to feel, quite tangibly, the upthrust force which depends on the amount of water being pushed aside (displaced). Draw a diagram representing the forces at work here. What if the ball was full of a dense material like steel, rather than air. Imagine it almost submerged. How would the upthrust from the water compare with that for the netball in the same situation? Why would the netball pop up, and the steel ball sink, in this situation? BRICKS SUPPORTED BY WATER? Key idea: Water exerts an upthrust force that opposes the force of gravity and effectively lessens the weight of objects. one or two bricks a long cord to tie to the brick/s a garbage can full of water. Lower one or two bricks, suspended by a long cord, into the water. Predict what you will feel before trying it. 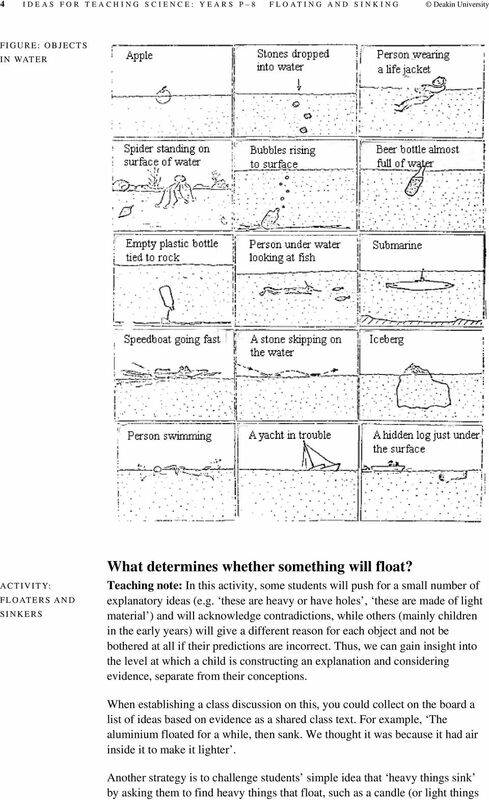 Write a statement that captures what the last two activities tell us about why things float. Explanatory note: As the bricks enter the water, the weight felt in the rope becomes much less because now the upthrust from the water is helping support the bricks. MEASURING UPTHRUST Key idea: Water exerts an upthrust force that opposes the force of gravity and effectively lessens the weight of objects. an elastic band plasticine a bucket full of water. Attach a lump of plasticine to an elastic band. The stretch of the elastic band is a measure of the weight. If the plasticine were heavier the band would stretch more. 8 8 IDEAS FOR TEACHING SCIENCE: YEARS P 8 FLOATING AND SINKING Deakin University Predict what will happen to the stretch of the band when you lower the plasticine into water. Try it. Now explain in terms of a diagram of the forces. Explain it in words. You might like to try this with a spring balance. What could you measure? 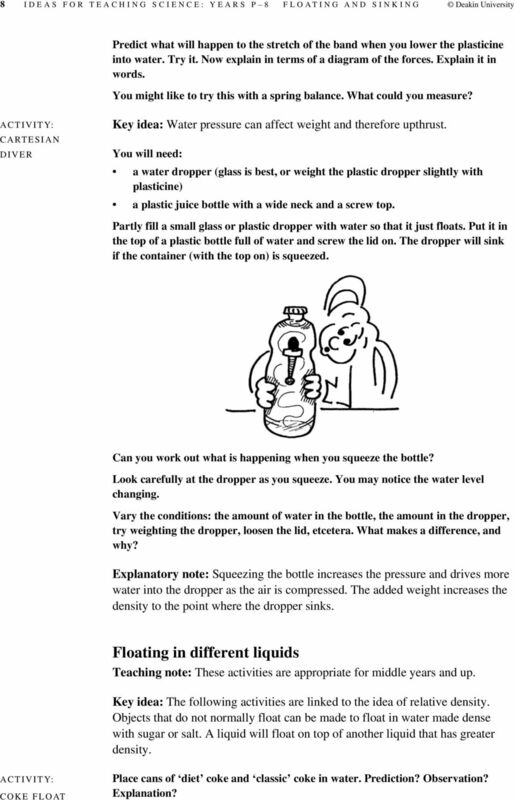 CARTESIAN DIVER Key idea: Water pressure can affect weight and therefore upthrust. a water dropper (glass is best, or weight the plastic dropper slightly with plasticine) a plastic juice bottle with a wide neck and a screw top. Partly fill a small glass or plastic dropper with water so that it just floats. Put it in the top of a plastic bottle full of water and screw the lid on. The dropper will sink if the container (with the top on) is squeezed. Can you work out what is happening when you squeeze the bottle? Look carefully at the dropper as you squeeze. You may notice the water level changing. Vary the conditions: the amount of water in the bottle, the amount in the dropper, try weighting the dropper, loosen the lid, etcetera. What makes a difference, and why? Explanatory note: Squeezing the bottle increases the pressure and drives more water into the dropper as the air is compressed. The added weight increases the density to the point where the dropper sinks. 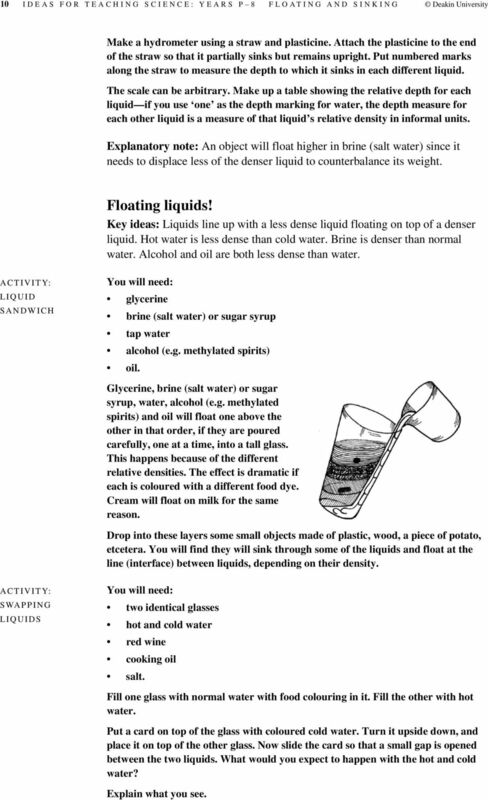 Floating in different liquids Teaching note: These activities are appropriate for middle years and up. 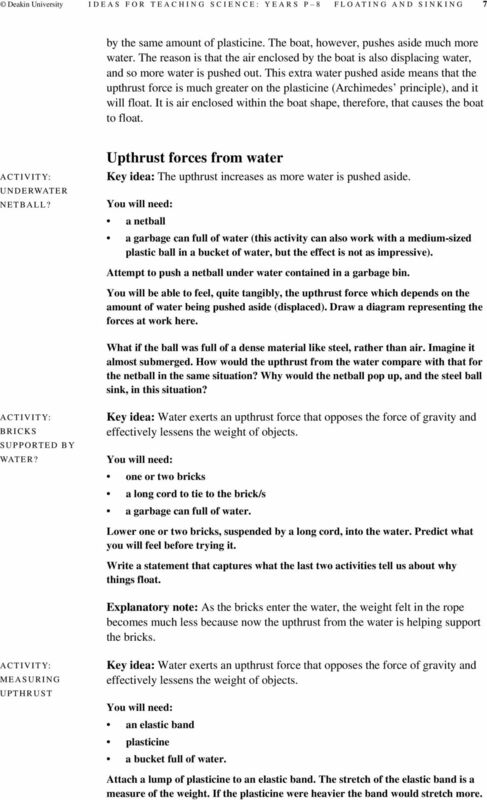 Key idea: The following activities are linked to the idea of relative density. Objects that do not normally float can be made to float in water made dense with sugar or salt. A liquid will float on top of another liquid that has greater density. COKE FLOAT Place cans of diet coke and classic coke in water. Prediction? Observation? Explanation? 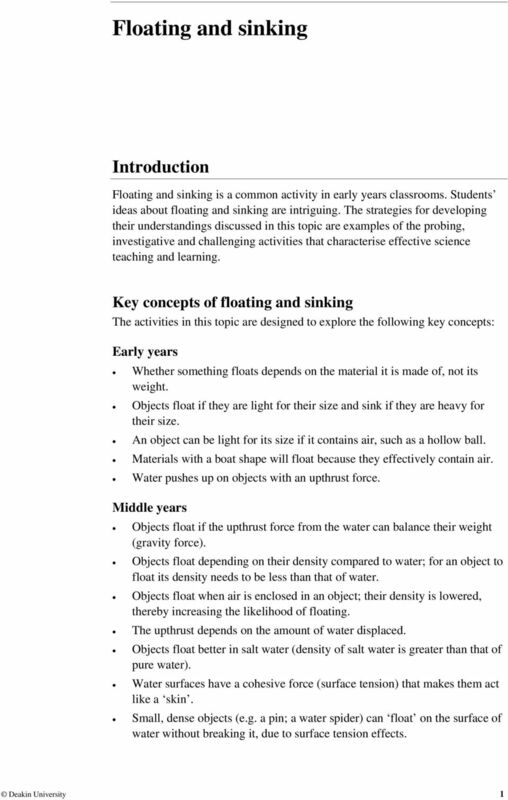 9 Deakin University IDEAS FOR TEACHING SCIENCE: YEARS P 8 FLOATING AND SINKING 9 EGGS CEPTIONAL! POTATO FISH FLOATER a fresh egg salt bowls of water. Place a fresh egg in fresh water, then in salt water. Notice what happens. Put a fresh egg in a bowl of water, then add salt to the water. The egg will float. Now, with care, start over again and arrange for fresh water to sit on top of the salt water. The egg will float but where? salt a container half full of water another container of fresh water coloured dye a potato cellophane. Mix a cup of salt into a container half full of water to make brine. Once this is done, carefully fill the container with water containing coloured dye. This should sit on top of the brine. Make a fish out of a slice of potato, using some coloured cellophane for fins. Place the fish in a container of fresh water. It should sink. What do you predict will happen if you put your fish in the container with dyed water and brine? Try it and see. 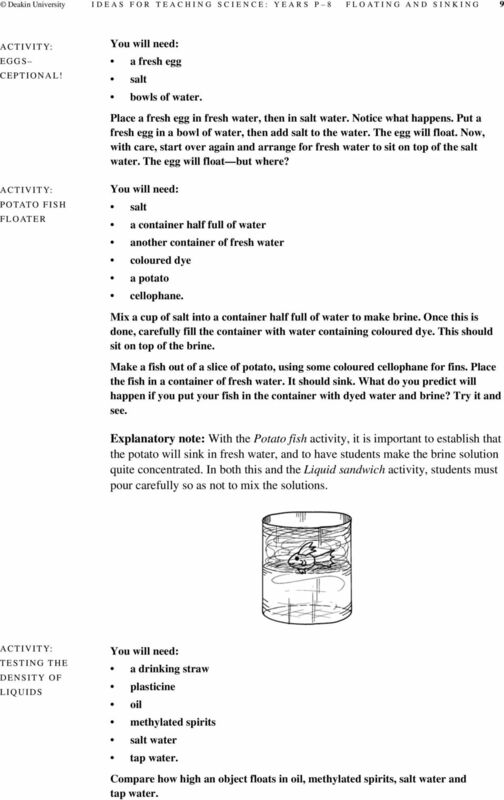 Explanatory note: With the Potato fish activity, it is important to establish that the potato will sink in fresh water, and to have students make the brine solution quite concentrated. In both this and the Liquid sandwich activity, students must pour carefully so as not to mix the solutions. TESTING THE DENSITY OF LIQUIDS a drinking straw plasticine oil methylated spirits salt water tap water. Compare how high an object floats in oil, methylated spirits, salt water and tap water. 10 10 IDEAS FOR TEACHING SCIENCE: YEARS P 8 FLOATING AND SINKING Deakin University Make a hydrometer using a straw and plasticine. Attach the plasticine to the end of the straw so that it partially sinks but remains upright. Put numbered marks along the straw to measure the depth to which it sinks in each different liquid. The scale can be arbitrary. Make up a table showing the relative depth for each liquid if you use one as the depth marking for water, the depth measure for each other liquid is a measure of that liquid s relative density in informal units. Explanatory note: An object will float higher in brine (salt water) since it needs to displace less of the denser liquid to counterbalance its weight. Floating liquids! Key ideas: Liquids line up with a less dense liquid floating on top of a denser liquid. Hot water is less dense than cold water. Brine is denser than normal water. Alcohol and oil are both less dense than water. LIQUID SANDWICH glycerine brine (salt water) or sugar syrup tap water alcohol (e.g. methylated spirits) oil. Glycerine, brine (salt water) or sugar syrup, water, alcohol (e.g. methylated spirits) and oil will float one above the other in that order, if they are poured carefully, one at a time, into a tall glass. This happens because of the different relative densities. The effect is dramatic if each is coloured with a different food dye. Cream will float on milk for the same reason. Drop into these layers some small objects made of plastic, wood, a piece of potato, etcetera. You will find they will sink through some of the liquids and float at the line (interface) between liquids, depending on their density. SWAPPING LIQUIDS two identical glasses hot and cold water red wine cooking oil salt. Fill one glass with normal water with food colouring in it. Fill the other with hot water. Put a card on top of the glass with coloured cold water. Turn it upside down, and place it on top of the other glass. Now slide the card so that a small gap is opened between the two liquids. What would you expect to happen with the hot and cold water? Explain what you see. 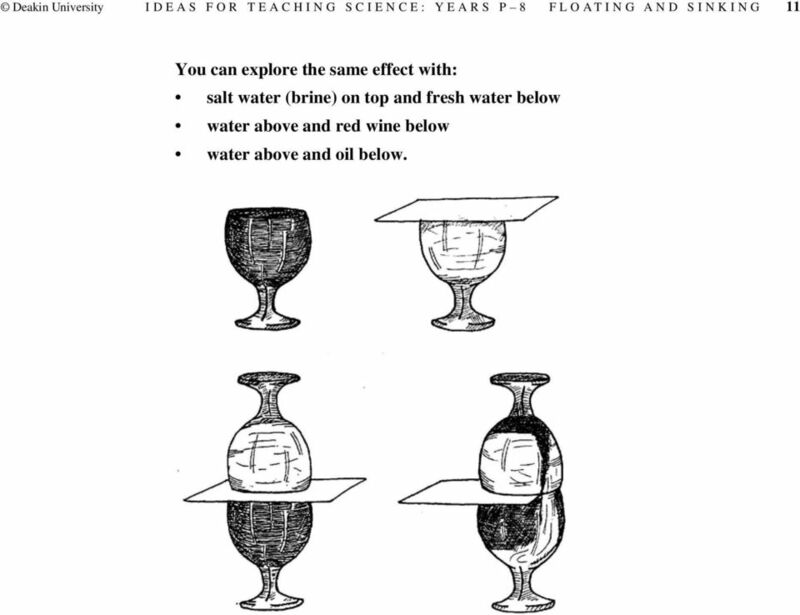 11 Deakin University IDEAS FOR TEACHING SCIENCE: YEARS P 8 FLOATING AND SINKING 11 You can explore the same effect with: salt water (brine) on top and fresh water below water above and red wine below water above and oil below. Quick Peek. H Students will learn about. H Students will design and. Students will learn about density, buoyancy, and how submarines dive. Why do objects float or sink? Description: Students design, construct, and test a device that exhibits positive, neutral, and negative buoyancy. Balloon Rockets. 2. Set out tables for groups to sit round. Make sure each table has everything needed for a team to build a balloon rocket. Name Class Date. F 2 2269 N A 1 88.12 cm 2 A 2 1221 cm 2 Unknown: Step 2: Write the equations for Pascal s principle and pressure, force, and area. Skills Worksheet Math Skills Pascal s Principle After you study each sample problem and solution, work out the practice problems on a separate sheet of paper. Write your answers in the spaces provided. Reluctant Oil Well. see it! Chapter 6. Volume. Volume by Counting Cubes. Exercise 6 1. 1 cm 3. The volume of a shape is the amount of space it takes up. GRADE 1: Materials 1. UNIT 1M.1 12 hours. Identifying materials and their uses. Resources. About this unit. Previous learning. The Thermometer. Key Stage 3 Science. Cross Curricular KS3 History Shipbuilding. Pascal s Principle. Any change in the pressure of a fluid is transmitted uniformly in all directions throughout the fluid. Buoyancy and Air Bladders: Passing gas Follow up in Textbook: pp. 421-423 A. Objective: Explain how fish swim bladders produce neutral buoyancy. Explain how changes in atmospheric pressure influence buoyancy. CLASSROOM VISIT MAGNETS Page 1 1 Pre-Outreach Activity: What Do We Already Know? Teacher A simple, yet effective learning strategy, a K-W-L chart, is used to help Background: students clarify their ideas.